The image of the country is greatly formed by the cultural, political, historical, social, linguistic, ideological symbols. They are the things, facts, quotes, characteristics or events that are exclusive for a state or nation, either truly or stereotypically. The country's symbols are what a particular country or nation is immediately recognized for internationally. They form a steady cross-cultural associations, like Sputnik and ushanka (fur cap) equals Russia; Walt Disney and Coca-Cola = America, pizza and carnival = Italy; Buckingham palace and pudding = England; kung-fu and needle therapy = China, bullfight = Spain; yoga = India; Olympic Games = Greece; samurai and cherry blossom = Japan, beer = the Check republic, Louvre, perfumes and croissant = France. Just like any other country Russia’s international profile is greatly affected by the media, which is responsible for lots of misleading stereotypes, political illusions, and social myths. Many of them are just comic and have nothing to do with real modern life in the country. However there are a lot of cultural phenomenon, masterpieces of art, scientific and technological inventions, meaningful events and discoveries, facts, figures and personalities that make Russia’s contribution into the global culture, science and progress a lot more meaningful than many tend to think. The art of Palekh is a part of the world culture and internationally known symbol of Russian art and culture. Palekh miniature appeared after the Russian revolution of 1917 when the icon painters Ivan Golikov and Ivan Glazunov had to look for alternative to Christian art, persecuted by the State. Their first works became a sensation both in Russia and abroad. Then Russian folk handicraft of miniature painting developed the Artel of Ancient Painting. Russian folklore, classical literary works, Biblical legends, and poeticized historical events provided a great variety of content for the lacquer miniature - varnished articles made of papier-mâché. Dynasties of painters made Palekh a world famous, unique center of lacquer miniature and the local lacquer boxes became one of Russian emblems. Sputnik 1 (Russian: "Cпутник-1") was the first artificial satellite to be put into Earth's orbit. It was launched into an elliptical low Earth orbit by the Soviet Union on 4 October 1957. The unanticipated announcement of Sputnik 1's success precipitated the Sputnik crisis in the United States and ignited the Space Race. The launch ushered in new political, military, technological, and scientific developments. While the Sputnik launch was a single event, it marked the start of the Space Age and emphasized the superiority of the USSR in space development. The elevated status of the Soviet Union forced the Americans to take up a more offensive stance in the emerging space race, it emphasized science and technological research in the US. Onion shaped dome are the symbol of Russia and a typical feature of Russian architecture. Visiting Russia one can see a glimpse of centuries-old golden domes from almost everywhere. It is either a golden-domed Saint Isaac's Cathedral that dominates St-Petersburg skyline or the magnificent Cathedral of the Annunciation in Moscow or golden and blue domes of Trinity Lavra of St. Sergius in Sergiyev Posad. Golden domes are the trade mark of ancient Russian cities and the cities of the Golden Ring of Russia. Onion-shaped domes first appeared during the reign of Ivan the Terrible replacing the traditional helmet domes. Golden domes signify divine glory, and crown most of the main cathedrals located in big cities. Temples consecrated in honor of the Mother of God have blue domes with gold stars, which symbolize the Star of Bethlehem. Domes built in honor of the Trinity have green domes, and temples consecrated in honor of saints have green or silver domes. Gold domes of Russian churches are also said to be candles (which they can look like from a distance) burning up toward Heaven. Tetris (Russian: Тетрис) is a puzzle video game originally designed and programmed by Alexey Pajitnov in the Soviet Union. It was released on June 6, 1984, while he was working for the Dorodnicyn Computing Centre of the Academy of Science of the USSR in Moscow. It is also the first entertainment software to be exported from the USSR to the U.S. Since then the game established the reputation one of the most popular games ever. Electronic Gaming Monthly's 100th issue had Tetris in first place as "Greatest Game of All Time". In 2007, Tetris came in second place in IGN's "100 Greatest Video Games of All Time" (2007). It has sold more than 70 million copies. In January 2010, it was announced that Tetris has sold more than 100 million copies for cell phones alone since 2005. 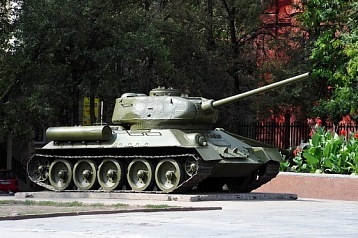 The T-34 was a Soviet medium tank produced from 1940 to 1958. Although its armour and armament were surpassed by later tanks of the era, it has been often credited as the most effective, efficient and influential design of World War II. The T-34 was the most important weapon fielded by the Red Army in World War II. First produced at the KhPZ factory in Kharkov, Ukraine), it was the mainstay of Soviet armoured forces throughout World War II, and widely exported afterwards. It was the most-produced tank of the war, and the second most-produced tank of all time, after its successor, the T-54/55 series. In 1996, T-34 variants were still in service in at least 27 countries. The Firebird is a Russian folklore character. It is a symbol of wealth and happiness and an object that the hero of the tale is ordered to capture. Only virtuous and kind man can succeed in getting it. The glow from the Firebird’s feather is powerful enough to light up an entire room. It is also believed to bring hope and relief to the suffering and in need. But the image of Fire Bird goes beyond the fairy tales. It did not only inspire Russian writers and composers but is occurring in Russian sayings. To catch a firebird by her tail is a widespread expression meaning to be unexpectedly lucky. To go seek a Firebird often means change one’s fortune and try different, hopefully better options. It is natural for Russian mentality to expect a Firebird, which with some mystic powers would change life for better with no or little effort to take. Samovar is a cultural symbol of Russia. It is an essential element of tea ceremony, associated with traditional Russian hospitality and home comfort. Samovar is a heated metal container traditionally used to heat and boil water. Samovars come in different body shapes: urn- or krater-shaped, barrel, cylindric, spherical. Classical Russian samovars were made of brass. Since the heated water is usually used for making tea, many samovars have a ring-shaped attachment seated around the chimney to hold and heat a teapot filled with tea concentrate. Though traditionally heated with coal or charcoal, many newer samovars use electricity. Similar devices were used in China, yet Samovar in its traditional shape is a purely Russian invention. It’s motherland is the Urals. Samovars were produced in the Urals, Moscow, Saint-Petersburg, Tula; and later in Vladimirskaya, Yaroslavskaya and Vyatskaya provinces and spread all over Russia. Russian samovar is not only a kitechn utensil, but can be a real artwork with engraving, decorative handles and paintings. Table-glass or granyonyi stakan (Russian: гранёный стакан, literally faceted glass) or granchak is a type of drinkware made from especially hard and thick glass and having a faceted form. It is a very widespread form of drinking glass in Russia and the former Soviet Union. Granyonyi stakan has certain advantages over the other drinkware, since due to its form and hardness it is more difficult to break. It is often used in combination with tea glass-holder (podstakannik). Drinking glass became a preferred one and was massively produced in the Soviet Union because it was more fit to be washed using dish washing machines. A legend tells that the 14-facets form was designed by a famous Soviet sculptor Vera Mukhina. The popularity of hard-to-break table-glasses diminished after 1970-s. Nowadays granchaks are somewhat symbolic of the Soviet era and sometimes perceived as souvenirs. Antonov or AN-225 is the world’s heaviest and largest jet ever built with the landing gear system of 32 wheels and a wing span of 291 feet. It was designed for the Soviet space program in 1988 and able to airlift the Energia rocket’s boosters, Buran space shuttle or ultra-heavy and oversize freight, up to 250,000 kg (550,000 lb) internally or 200,000 kg (440,000 lb) on the upper fuselage. Cargo on the upper fuselage can be 70 m long. 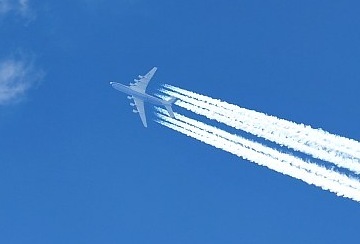 In November of 2004, FAI placed the An-225 in the Guinness Book of Records for its 240 records and overall outstanding aerial performance.